The solution is simple to create a PDF from multiple Screenshot or other Images with WinScan2PDF or from multi frames TIFF file! 1.) ... Add images to the PDF! 2.) ... Multi-frames / pages support from Version 3.83! 1.) Add images to the PDF! Please drag the Image to the List-View of WinScan2PDF! For example from Windows-8 Screenshotfolrer %UserProfile%\Pictures\Screenshots! See also: Create a screenshot in Windows 8.1 / 10 and auto-save it as a file! (Image-1) Create a PDF from multiple Screenshot or other Images! 2.) Multi-frames / pages support from Version 3.8.3! For example TIFF format allows multiple images in one file. From version 3.83 you can also add TIFF images that contain multiple images in one file. Here in the example a Tiff picture with three pages, recognizable by the marking Page_1, Page_2, Page_3. See also: ► How can I set the order of the individual PDF pages? (Image-2) Multi pages import support tiff images to pdf! Multi pages import support for example from tiff images. Many documents are made as a PDF file. What exactly a "PDF" file is and how you create such a file yourself, we explain to you in this practical tip.Simply successful: The Portable Document Format - in short: PDF - was developed and published by Adobe Systems around 20 years ago. Since then, document format has become indispensable in the digital world. With the file format it should be possible to pass on electronic documents true to the original regardless of the application program or operating system. This can be illustrated well with text documents: For example, if a text document created with Word is saved as a doc file and opened on another PC with other software, the document may not be displayed in the correct font or the line breaks may be lost as originally thought to be displayed. Such conversion problems can be bypassed by saving the text document as a PDF file. The document is then always true to the original. However, no further changes can be made to the document. However, this can be an advantage because the creator of a PDF file has the option of preventing unwanted changes to the document or even printing. 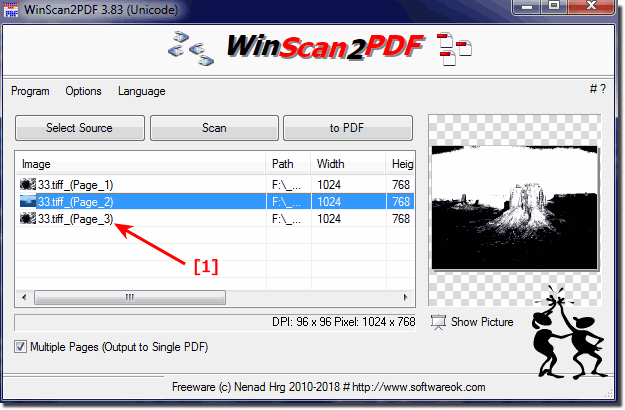 WinScan2PDF - FAQ-6: How to create a PDF from Screenshot or other Images? How ro create pdf with android screenshots? Create a pdf out of screenshots? Create a pdf from screenshots? Create a pdf from screenshot?